This to me, has an insanely obvious answer. 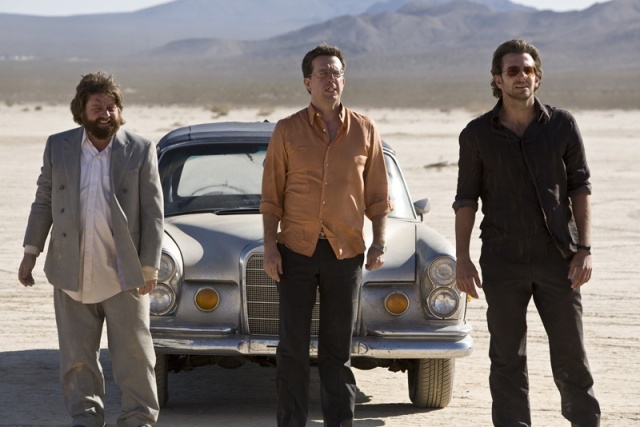 The Hangover is undoubtedly my favourite comedy ever, and one of my favourite movies of all time (when I say that, I'm not meaning it is the greatest movie I have ever seen. I just really enjoy watching it). Every time I watch it I still laugh at the same stuff. I guess it has something to do with the fact that I didn't know the actors very well when I watched this, so I didn't know what to expect. You know what to expect from actors like Will Ferrell or Jon Heder. But Bradley Cooper, Ed Helms and Zach Galifianakis are a breath of fresh air. Their jokes are actually funny. That's the best thing about this movie. And it has a clever storyline. In a funny way, it's like a funny and easy to follow version of Memento...these guys lose their memory and half to piece together the clues to find their buddy. Forget I even made the comparison, that's not very 'cinephile' of me. What I find surprising is the fact that I have only posted about The Hangover once. Back when I first watched it. I must admit, that post didn't say enough. Okay, so The Hangover isn't some indie comedy or a screwball from the early 30s (though one of my other favourite comedies is It Happened One Night), but there are times where you just can't live for a cinephile's expectations. I enjoy The Hangover every time I watch it, even if it is just a gross out comedy. But it's different from the rest...it's actually funny.